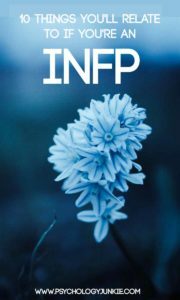 The INFP is one of the most rare and misunderstood personality types in the Myers-Briggs® system. Making up only 4.4% of the US population, you are unlikely to come across many of them in your daily life. They are known for their idealism, passion, authenticity, and commitment to their dreams. Certain other types (ISFPs, INFJs, and ENFPs) mistype as INFPs regularly and INFPs themselves often mistype as INFJs, so hopefully this list will help to bring clarity to this unusual and intriguing personality type! Not sure what your personality type is? Personality Hacker has the most accurate free online personality indicator I’ve been able to find. Click here to take it. (This is an affiliate link). I know from a gut level when something seems good or bad or aligns with my values or not. My work, my lifestyle, the kind of art and music I enjoy, everything has to resonate with what I feel is worthwhile, meaningful, and authentic to what I believe in. I know I’m a feeling type and some people think that means that I’m really emotional, but that’s not what it’s all about. Everyone has emotions. My feeling preference means that I am always evaluating what’s important, what is of value, and what is worth believing in and fighting for. I look for authenticity and deep inner meaning and personal significance. Anyone can be emotional, but the truth is I’m actually guarded about my emotions and only like to share them with people I really trust. In everything I do I aim to be sincere. I’m highly attuned to behaviors and attitudes that are emotionally manipulative or inauthentic and those will turn me off instantly. I pay close attention to the values that other people say they believe in, and then I can’t help but notice if their lifestyle matches the rules, beliefs, and values they espouse. Many times I’m surprised by the way people will say they believe in one thing and then live a lifestyle that doesn’t match up with that belief. For example, people who preach “the golden rule” but clearly put themselves above everyone else. Growing up there were certain “social norms” that people expected me to follow. But then and now, I can’t embrace those things unless I really believe in them and they feel right to me. This doesn’t mean I can’t play “pretend”, imagine, or enjoy acting. But it does mean I’m not going to put on a certain persona to try to “fit in” with what other people want from me. At the same time, I do strive to be compassionate, kind, and tactful with people. I am drawn towards people who are misfits, outcasts, and underdogs. I believe that people who don’t fit in with the crowd have a lot to offer the world, and I believe that their story, their experience, and differences make them beautiful and fascinating. I see change as an opportunity for personal growth, and I like to have lots of options and possibilities available to me. I like to imagine numerous potential outcomes and explore many different meanings and theoretical ideas. Learning new things, exploring new places, listening to the stories of unusual people is always fascinating to me. I like to explore ideas, dreams, and visions of the future and what could be. Generating possibilities and imagining many potential scenarios invigorates me and provides a relaxing escape from the mundane details and chores involved in daily life. I see all kinds of projects and possibilities in the things that other people overlook. I like to create beauty out of ideas or even tangible objects like rocks, leaves, or thrift store finds. I’m very creative and I like to use that creativity to make stories, art, or symbolic treasures to have or give away. Most of the time I enjoy envisioning future possibilities and scenarios, but sometimes I love to get lost immersing myself in memories from my past. Whether it’s listening to an old favorite song over and over again, or reading a childhood book that I once loved, soaking up favorite memories and activities can make me feel relaxed and cheerful. Simultaneously, if I have bad or embarrassing memories, I can find these entering my mind at times when I don’t want them to and I can feel the same embarrassment or frustration exactly like I did years ago. Being forced to do things in a conventional way makes me feel stifled. I like to use my imagination to find new and creative ways to improve on something or do it better. The idea of working a 9-5 office job repeating the same projects day after day is mind-numbing to me. I like knowing that the future is full of unexplored options and possibilities and that nothing is set in stone. Do you relate to these INFP qualities? Do you have any others you’d like to share? Let us know in the comments! Want an INFP Starter Kit? Find out how you can thrive in your relationships, career, and creative life with Personality Hacker’s specialized, in-depth starter kits. (This is a referral link). I feel as though the majority of these things are right on the nose for me. Except for number 10. As a soldier I love my life which is primarily routine.